Larscraft is a family business that grew up out of an idea of a 7-year-old Maker. You may wonder why in the world would a 7-year-old child want to start a business. Seven year old kids are supposed to be dreaming about riding their bikes and begging mom and dad to take them to Disney World. Lars is no different in that respect. The biggest difference he has had in his life is the exposure to mom and dad working in their offices and their warehouse. I haven’t asked him, but I bet some of his earliest memories include riding his bike through the warehouse or napping in the corner of his play room. Lars has been in our (mom and dad) peripheral as we enjoyed some major successes and a notable massive failure in our journey as entrepreneurs. He has bore witness firsthand to his parents’ determination to create and sustain a business. Some of this may have subconsciously rubbed off on him. Sure. It’s possible. But I don’t think that’s what drove him to want to create Larscraft. The most important thing that we’ve done with our children is to encourage a Maker mindset. It started when he was young with stackable blocks and shapes. Now we have those wonderful magnetic tiles and magnetic shapes. From there, it expanded into interlocking bricks. Our go-to brand for bricks just happens to be Lego®. 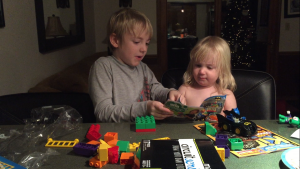 It began with the larger sized Duplos® and naturally transitioned into the smaller ones. We would build with him and encourage him to build. Sometimes we’d pose challenges to him as well. And I’m completely guilty of sitting him in front of his Duplos so I could make dinner! Grandpa would occasionally take him to the local hardware department store the first Saturday of the month for their little kit building events. A bird house, a letter holder, a flower pot. They weren’t always the most handsome crafts, but we proudly displayed them. Therein lies the key to his desire to create. We embraced the process of making. Much like the commitment to evening and weekend sports, we commit to making things with our kids. For those who aren’t familiar with the term, we call those who make ‘Makers’. Which kind of makes sense when you think about it. Kids are inherently curious. All we did was encourage that curiosity. It takes less than two hours a week to make this kind of an of impact. Fifteen minutes a day for direct one-on-one time with eye contact and no other distractions. Get out some legos or some coloring paper. Write a poem. Plant a garden. Cook an egg. Repair the kitchen stool. Take a moment to slow down, and include the short people in your home. You won’t be sorry.